Battles intensify around Libya capital as thousands displaced - SABC News - Breaking news, special reports, world, business, sport coverage of all South African current events. Africa's news leader. Men load ammunition belts at a position held by forces loyal to Libya's Government of National Accord (GNA) in the suburb of Wadi Rabie about 30 kilometres south of the capital Tripoli. Forces answering to Libyan strongman Khalifa Haftar battled units that back Tripoli’s unity government on the edge of the capital Friday, days into a new round of conflict that has killed dozens and displaced thousands. Gunfire and blasts rang out and smoke rose as forces backing the fragile UN-backed government of Fayez al-Sarraj attempted to block an offensive by Haftar’s self-styled Libyan National Army (LNA). Dozens of people have been killed and more than 300 wounded over the last eight days, the World Health Organization said on Friday. The United Nations said the fighting had driven 8,000 people from their homes and that “displacements from areas affected by the clashes in and around Tripoli continue to surge”. “Many families remain stranded inside conflict-affected areas,” with supplies running short, UN spokesman Rheal Leblanc told reporters in Geneva. French authorities said Friday they were in touch with all parties to Libya’s conflict. But they did not confirm a report in Italy’s La Repubblica, citing a source at the French presidency, saying Haftar had sent envoys to Paris several hours before he launched his offensive on Tripoli on April 4. “Like our partners, we talk to all parties in the Libya conflict, in order to obtain a ceasefire”, said Agnes von der Muhll, a spokesperson for France’s foreign ministry. “We were not warned about the offensive on Tripoli, which we condemned when it was launched,” she said. The LNA and Haftar refuse to recognise the authority of Sarraj’s Government of National Accord (GNA). Haftar, a former military commander under toppled dictator Moamer Kadhafi who later lived in the United States, has the support of key Gulf Arab states, Egypt and Russia. His forces swept from their eastern stronghold through Libya’s sparsely populated desert, including parts of the south, before announcing their assault on to Tripoli. 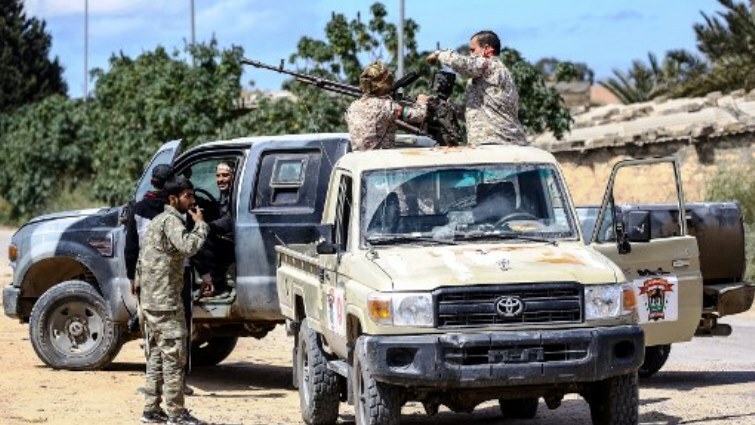 Haftar’s men were fighting GNA troops in the southern suburbs of the capital Friday, particularly in Ain Zara, Wadi Rabi and al-Swani, about 20 kilometres (12 miles) from the city centre. AFP journalists saw an air raid in Wadi Rabi, while other witnesses reported another air strike in Tajoura, in the eastern suburbs of the capital, apparently targeting a military academy. “A column of smoke was rising from this site into the sky,” witnesses said. Anti-aircraft fire was also heard in the region, near the capital’s Mitiga airport which was hit by the LNA in an air strike on Tuesday. An air strike Friday targeted an “empty and unused” barracks south of Zouara, near the Tunisian border, about 100 kilometre west of Tripoli, a security source said. The strike did not cause casualties, the source said, attributing the attack to Haftar. The United Nations had vowed to push on with a planned national conference set to begin Sunday to draw up a roadmap to elections, but has postponed it as the fighting escalated. The long-mooted polls are meant to turn the page on years of turmoil that have engulfed the north African country since Kadhafi was deposed in 2011. World powers, the UN and NATO have called for calm in Libya, but the clashes have shown no sign of abating. Libya has long been a major transit country for migrants desperate to reach Europe via the Mediterranean, with many held under abject conditions in detention centres. International aid groups have warned migrants could be used as human shields or forcibly recruited to fight. The International Organization for Migration said Friday it had flown 160 migrants to Mali — with some destined to return to the Ivory Coast and Burkina Faso — late Thursday. “We continue to support a safe and dignified return for migrants to their home countries,” said Othman Belbeisi, IOM Libya chief of mission, in a statement. This entry was posted on 12 Apr 2019,09:21PM at 9:21 PM and is filed under Africa. You can follow any responses to this entry through the RSS 2.0 feed. Both comments and pings are currently closed.